How much sugar is in a healthy diet? - take a look. How Much Sugar Is In A Healthy Diet? How Much Sugar Is In A ‘Healthy’ Diet? Are you eating what many people perceive as a healthy diet? Low fat? Fruit smoothies? Medjool dates? Weight watchers dinner? Low fat fruit yoghurt? Have you ever thought to yourself how much sugar is in a healthy diet? Take a look and see where all that sugar is hiding. Sugar has never been in our food supply like it is in modern times. With the low fat movement, along came the high sugar and carbs. When fat is removed, sugar is pumped in. Don’t believe me? Go and check out the regular version of products with their lite or fat free versions. Manufacturers know when fat is removed, products taste horrid so they pump back in sugar, flavourings and other nasties. Cereal for example is a modern phenomenon. Yes our grandparents grew up on oats, but cereals these days, especially children’s cereals, belong more in the dessert aisle than the breakfast aisle. And avoid those cereals that say they are full of dried fruit, which is nothing more than dried sugar. On top of this, sugary drinks are around in ever increasing volumes and regularity. Once soda was a drink to be enjoyed at birthday parties, now it is an everyday occurrence. A 600ml (20 fl oz) bottle is the equivalent of a child’s entire week of sugar following the daily recommended 3 tsp/day. So the message is to read your labels, eat unprocessed food, and to be aware of what you are eating, snacking and drinking. It’s about awareness then it is your choice and an informed choice. Take a look at this infographic showing a surprising amount of sugar hides in what many perceive as being ‘healthy’ choices. I’m hoping no one would eat all of this in a day, but it’s a bit of an eye opener. None of these servings are supersized, no sweets, no soda, no obvious high sugar foods here. Look out for hidden sugars and avoid them as often as you can. Day one of Sugar Free September, here we go:) Good luck everyone! Fortunately I would not eat that amount of sugar in a week maybe month. With skipping breakfast weekdays and lunch weekends.Only drink black coffee and black tea. Gave up Sugar in drinks when it went from 3d to 6d a pound and I was about 13 probably before you were thought of Libby :-). Gave up milk when about 24. Very rarely do I have even hidden sugar except in a glucose tolerance test. Some fruit occasionally but try to keep to low sugar ones. Wine and Spirits would give me some but no mixes with sugar. I love your websites and all your recipes. Have been on LCHF for 1 month and it is coming off slowly. Looking forward to September no sugar and see how this goes. Very excited about this Month! My birthday is at the end of this month and I’m hoping to be down 10-12 lbs by then. I’ve been doing LCHF and counting macros but I know I could do much better. Good luck to Everyone! Let’s do this! I a so excited to do the sept IQS challenge I’ve been cutting out sugar and carbs for awhile now it still is hard some days …. And what is the “normal amount of sugar” adults / children should be getting daily? The World Health Organisation (WHO) recommends 3 tsp per day for children and 6 for adults. Take a look at cronometer.com Darn stupid auto correct has changed it to include an h which is indeed time and watches! Hey Libby! 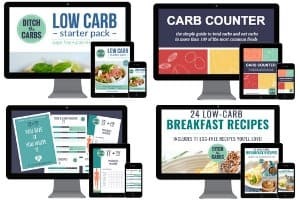 I love your website 😊 Quick question… I’ve been going low carb (keto) for nearly 3 weeks, 30-35g net carbs/day. In the past couple of days I’ve been struggling with gastroparesis and feeling very uncomfortable! My immediate solution is to raise my carbs to 50-60g so I can add in foods with high potassium (pumpkin, nut butter) as I feel it may be an electrolyte imbalance. Have you come across anything like this before? Here are 2 good threads to read from others who experience GP. Here and here. Here is another article worth reading. Hello and good day! I love the graphics! And so true. I have to work hard as my kids easily want to fall back to foods we “can” make that are just “better” images of what they used to eat. But they are not ideal for health, I know.—Dates used to be my nemesis. I LOVED dates. I’m not saying we should all eat tons of dates. I am well aware that each individual has a diet that suits him/her best, but I wanted to share that Bedouins in the Middle East and North Africa rely on dates as a staple food. In times of low food access, they rely on dates and camel milk. Isn’t that fascinating?—But, yes, I know that I do best not relying on carbohydrates as the bulk of my diet. Maybe if I was walking uphill in the desert I could eat how I wanted!! LOL!—-Beautiful work! It was 91 degrees here yesterday. I can’t wait for the fall weather! I love your website. I’m excited to begin the 30 day no sugar challenge! Thank you! It amazes me how many paleo recipes call for medjool dates. I avoid sugar like the plague! Some bloggers use coconut sugar, honey etc. thinking they are using a healthy product. Our bodies can’t tell the difference between coconut sugar, white sugar or honey. Sugar is sugar and is to be avoided. I have been getting your emails for quite some time now and have made quite a few of your recipes. Keep up the good work. I am in the USA. Hi, where do you get the sugar grams for the latte? Is it because it is soy? I have taken to having a short breve latte when I started LCHF (a latte made with espresso and half-and-half, sometimes in fact cream) no sugar etc. Is that still bad? All values were found on chronometer.com and the exact foods are at the bottom of the infographic. Be careful of coffees made with syrups and flavours, and the large volume of milk are where the sugar is coming from.